Another offering from Ted Talbot who says that he doesn't know where this is, or even whether it is LNWR. The signal cabin and station waiting room are not LNWR. If in Cumberland would suggest Cleator and Workington Junction Rly. Not anywhere in Cumberland that I would recognise. This is Grindley on the Stafford to Uttoxeter line later owned by the GNR after the original company went bust. It was an early closure to passengers in 1939, but the line stayed open for freight until 1951 and was lifted in 1959. The view is definitely of Grindley station on the Stafford & Uttoxeter Railway. The view looks east towards Bromshall Junction. The GNR purchased the Stafford & Uttoxeter Railway in 1881 and re-equipped the line. 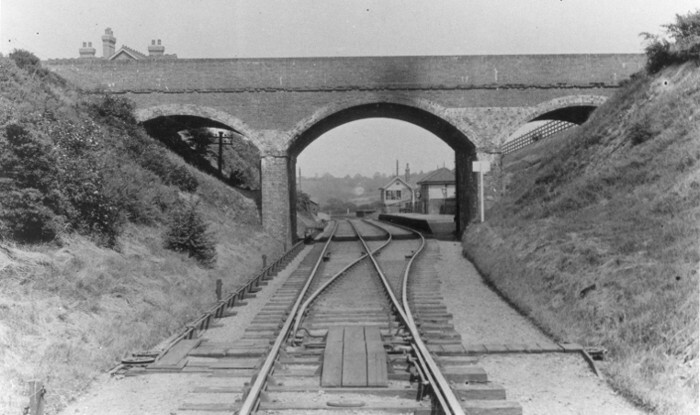 The passing loop at Grindley with staggered platforms was installed shortly after this time and the line was re-signalled. The re-signalling work was undertaken by McKenzie & Holland and the signal box in the picture had 16 levers all of which were in use in 1882. Other pictures of Grindley Station are here. And another version of the picture is here.